It’s always gut-wrenching to see hundreds of dollars mysteriously missing from your bank account, especially when it happens after a seemingly boring fill-up at a local gas station. In Houston, many residents say they’ve felt that pain because of credit card skimmers, devices that are designed to extract credit card information at a point of sale. Authorities say credit card skimming has become a major problem in Houston area and throughout Texas over the last several years, leading to a push for more data from the Texas Department of Agriculture. “Convenience stores, law enforcement and consumers all play a crucial role in preventing skimming at the pumps,” he said in the video. Harris County Sheriff’s Office Sgt. Joshua Nowitz recently told Chron.com that skimming suspects prefer gas pumps over ATMs because they can access the machine’s motherboard, making it nearly impossible for consumers to detect the device. 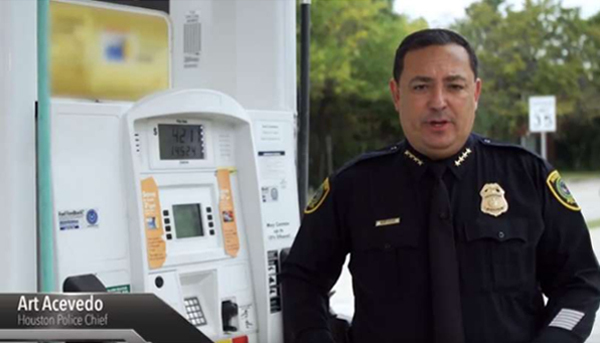 In the video, Acevedo said consumers can start by physically examining the pump for signs of forced entry. A misaligned pump door or unusual damage around the edges are key indicators a skimmer could be inside, he said. Sometimes, thieves overlay the credit card reader with a 3-D printed skimming device. Acevedo advised people to pull on credit card reader and run their fingers around the keypad to make sure they’re not loose.